For anyone that loves typography, design, words and books, these covers are absolutely perfect. All I can do now is dream that they get picked up and run with, because I would love these on my shelves as a series in hardback. This beautiful Pride and Prejudice piece is the result of Leah Doguet, a 22-year-old who currently lives in Philadelphia, Pennsylvania. “I recently graduated from Tyler School of Art with a degree in Graphic & Interactive Design,” she told The Bennet Sisters, and it’s obvious, from the series of covers she has designed below, that she’s very talented. 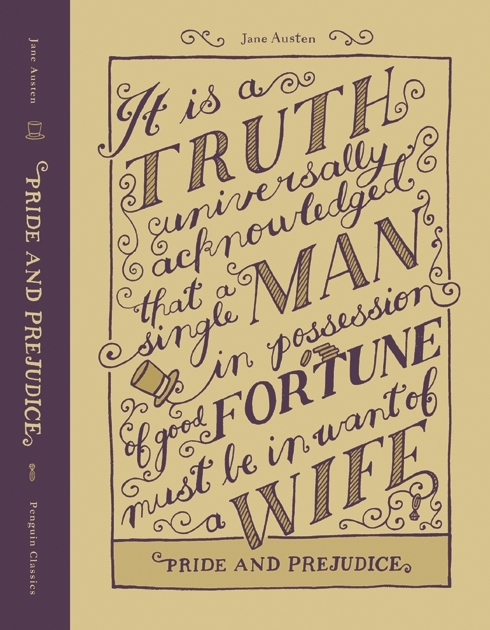 Having been looking for new Pride and Prejudice covers to showcase on this blog, I stumbled upon a beautiful design from graphic designer, Laurén Magda, a 23 year old recent graduate (College of Creative Studies – Detroit, Michigan). I just couldn’t say no to asking her more about it, and she agreed to share some of her thoughts about the book, her life, her design and Pride and Prejudice with The Bennet Sisters.